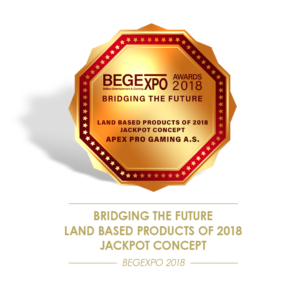 APEX GAMING WINS ‘BEST JACKPOT CONCEPT – LAND-BASED GAMING’ AT BEGE IN BULGARIA – APEX pro gaming a.s. This award indeed recognises an abundance of features that make the CLOVER LINK Jackpot Editions unique. First and foremost, the CLOVER LINK games, combined with a powerful four-level jackpot have registered success throughout the world. The sheer choice – with three completely different designs available – enables casino operators to position these games to best fit their own particular needs. In addition to that, operators can choose between different Pinnacle gaming machines for each design.